Yesh Atid chairman Yair Lapid continued his assault on Prime Minister Binyamin Netanyahu's coalition deal with United Torah Judaism Monday at his party's first faction meeting of the 20th Knesset. "To be the Prime Minister of all [citizens of Israel], Netanyahu must also act like that That's not what he does," Lapid charged. "Instead, he gives into pressure from small, sectoral parties." "Instead of use our tax money for security, education, health and welfares, he uses them for political payoffs," he added. Continuing, Lapid stressed that Yesh Atid would not sit silently by as Netanyahu and his fellow Likudniks "sell out the state" in favor of their political needs. "The Prime Minister is selling out the state and serving us all the bill," Lapid thundered. "When the Prime Minister signs a coalition agreement with United Torah Judaism that costs NIS 4.5 billion, he says to us 'that's politics.'" "Who said so? Do you know how much Yesh Atid's coalition agreement in the last government cost? Nothing! We didn't even take an agura. Why? Because Israeli citizens' money and politics don't have to be like that." 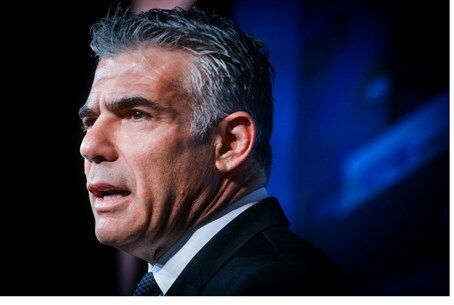 Lapid quickly noted that Yesh Atid would not give up and would fight against all attempts by Netanyahu to "sell out the state." "We will be a responsible opposition. When the government takes the right steps, we will support it, but we will not be silent against the attempt to sell out the country. We will fight here, in this building, in the court, and we will demonstrate in the streets, because we cannot let this country move backwards." Lapid has made good so far on demonstrations against the emerging government, as well as threats to turn to the High Court, telling Netanyahu on Saturday he would do so should the Prime Minister not appoint a full-fledged health minister.